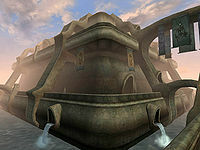 The Redoran Canton is one of the nine cantons in Vivec, located south of the Foreign Quarter, between the Hlaalu and Arena Cantons. 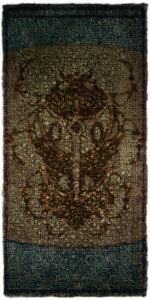 It is controlled by House Redoran and hosts many services for its retainers and visitors alike. The canton is also the site of two Morag Tong writs and several quests from Faral Retheran in the Redoran Treasury. It houses considerable Redoran treasures in its vaults. The Sixth House continues its assault on House Redoran in the sewers. Saren Manor has a trap door leading to Toris Saren, who is hiding from a Writ. It makes a nice home afterwards. In the Dralor Manor is a key to the Vaults in an unlocked cupboard upstairs. 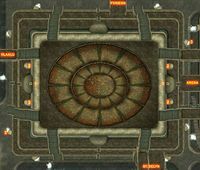 The Waistworks contains Redoran Prison cells, which leads to the Treasury, which in turn connects to the Plaza and the Vault. In the Treasury is Faral Retheran, a House Cousin and quest giver for House Redoran . A Scout and Drillmaster Quarters offers training. An Indoril helmet and shield are lying on a chest, another on a table. There are bunk beds for Redoran Retainers. Shops include a Smith and a Trader who will give you The Dwemer's Bone quest. The tavern Flowers of Gold is a gathering place for thirsty warriors and others seeking their courage. In the Lower Waistworks, the Redoran Temple Shrine offers Spell making services. 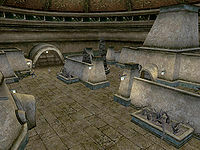 The Redoran Records is a small library with mostly religious texts and two copies of the book Antecedants of Dwemer Law. The Redoran Ancestral Vaults is guarded by three leveled Undead and an Ash Creature. It contains a crate with silver and magical weapons and three locked chests with gold. In the northwest corner is a small Sixth House altar guarded by an Ancestral Ghost, complete with an Ash Statue, Corprusmeat along with a corpse holding a Rusty Key and a Daedric Dagger. This is easily the best free loot haul in the entire game. It will have no effect on Redoran players' faction reputation (unless caught). Ahnassi might have told you that Dralor Manor in Redoran Plaza contains a key (in Favela Dralor's bedroom drawers) which opens two locked chests with gold and jewels. Or you may have just incidentally found it while poking around in Vivec homes. Ahnassi's details aren't quite right. The key legally disarms and opens the trapped[verification needed — Level of trap?] and locked Lower Vault door in the treasury, as well as some chests inside. The other contents of that room are worth far more, both in sale and gameplay value, than some gold and jewels, though you get those as well. Enter the Redoran Treasury, also in Redoran Plaza. 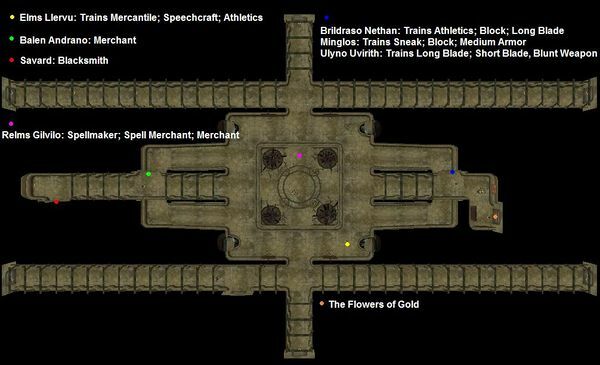 You'll find the Upper and Lower Vaults (both downstairs from the entrance) heavily guarded by retainers and Ordinators. The Lower Vault is on the bottom floor (where Drelse Dralor is). Simply use the key to enter this vault, which triggers no reaction from anyone. Go inside and wait for any guards in the vault to go out where Drelse is, then close the door. Since the cell door is coded as solid instead of see-through, you can pick up and unlock anything when alone in here, even when you can see guards through the door's bars. Random gold, jewels and/or low to high-end weapons and armor in three larger locked chests (the key does not work on them); this loot may be leveled. The Upper Vault is not opened by that key, and is also trapped and locked. Getting in is easiest done from the hallway, with Telekinesis (15 feet), a probe, and a Scroll of Ekash's Lock Splitter if you can't do Open for 95 points or pick such a lock. It's just a waiting game, for all the patrolling Ordinators to be out of sight at the same time for just long enough to cast, disarm, and unlock. Trap at least one guard back in the Lower Vault to reduce observers. A riskier but less-waiting variant is to do this routine directly behind Beldrose Dralor and add Sneak and Chameleon to hide your activities, or get him to turn around away from the door and do the same combo directly at the door but without the Telekinesis component. Once the Upper Vault is opened, you can plunder it, too, without any problem as soon as the guards leave and you close the door. 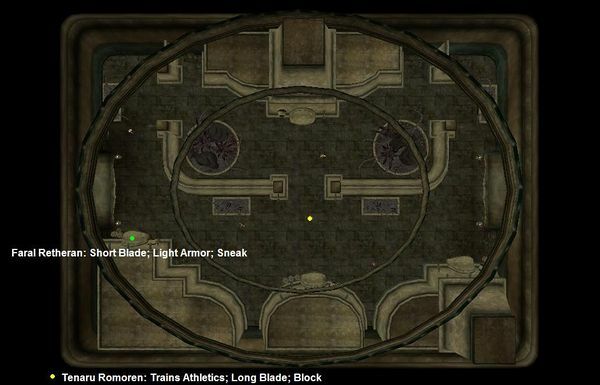 The main game-design purpose of this dual hoard of magnificent booty (among other ones, like Ghorak Manor with its scary-looking Orcs who docilely let you empty their armor crates) appears to be to give repeat players a way to gear up quickly and get on with it, having already been through the "explore in confusion and wonder, and fight innumerable rats and crabs" phase on their first play-through. New players focused on the Main Quest and faction quests are unlikely to find this Lower Vault key by accident or by Ahnassi quest (only available to males anyway) until perhaps fairly late in the game. Another purpose this "Rob-me Vault" may serve is helping out exploratory open-world players with little interest in quests, who have been leveling without receiving many or any quest rewards, but looking everywhere at everything. Vivec, Redoran connects to the Arena, the Foreign Quarter, St. Delyn and Hlaalu Canton. There are no Gondola services here. This page was last modified on 19 October 2018, at 21:37.